U.S based investment firm ACO Investment Group and its portfolio company Convalt Energy which is gearing up to become a global independent power producer, signed a Memorandum of Understanding (MOU) with Viet Lao Power Joint Stock Company to co-invest in three hydropower projects and co-develop solar power projects and transmission backbone in Lao PDR. 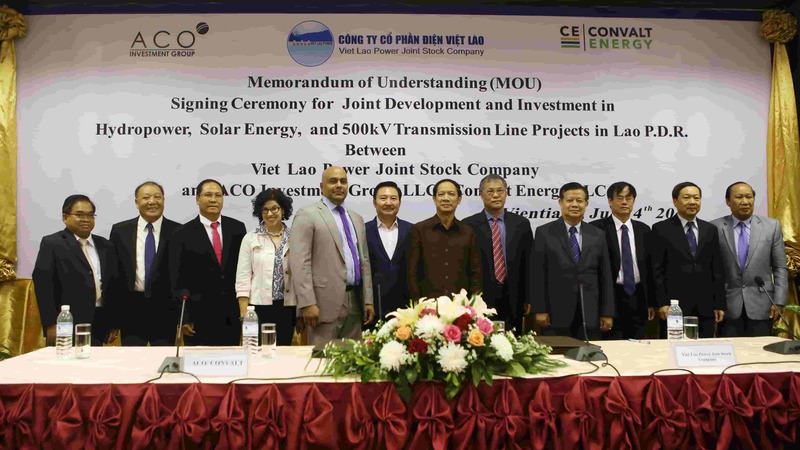 Viet Lao Power was one of the first Vietnamese companies to develop and successfully execute a number of hydro power projects in Lao PDR and sell electricity cross-border to Electricity of Vietnam (EVN) in Vietnam. The partnership between the companies entail potential investment and refinancing of Xekaman 1 hydropower (322MW), Xekaman 3 hydropower (250MW), Xekaman 4 hydropower (70MW) and development of one of the largest floating solar projects globally with a targeted capacity of 280MW, a ground mount solar development of 250MW in Attapeu province of Lao PDR and potential build-out of a 500kV transmission backbone across Lao PDR and interconnecting with Vietnam. The development also supports the Lao PDR government vision of becoming the battery of South East Asia and exporting electricity to its neighboring countries especially Vietnam. 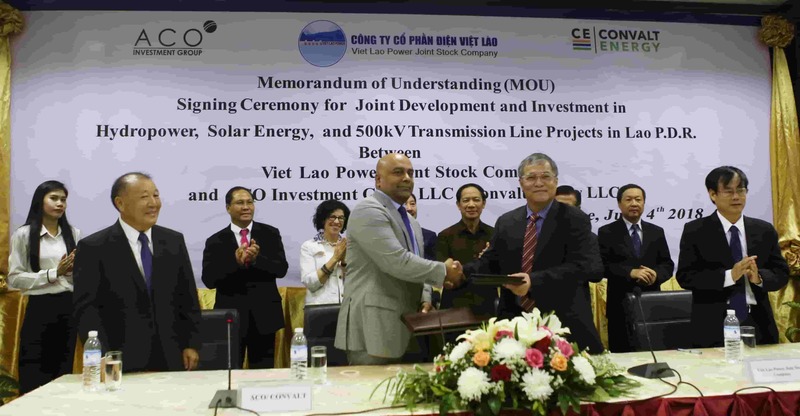 Lao PDR and Vietnam governments have signed a MOU for the export of 5000MW of electricity from Lao PDR to Vietnam by 2025. This partnership brings Vietnamese, American and Lao entities to work together in a consortium to help building renewable power in Lao PDR. Viet Lao Power Joint Stock Company’s shareholders include Song Da Corporation, Viet Ha Construction Investment Management Joint Stock Company, Lien Viet Post Joint Stock Commercial Bank and PetroVietnam Power Corporation and others. Convalt Energy is majority owned by ACO Investment Group and is active in South East Asia, India and Africa. Convalt is currently in early stage construction of a 300MW solar power project in Myanmar. The MOU signing ceremony was held at Vientiane Plaza Hotel and represented by Mr. Le Van Ton, Chairman of Viet Lao Power Joint Stock Company and Mr. Hari Achuthan, Founder and Managing Director of ACO Investment Group and Chairman of Convalt Energy. Attendees included various Lao PDR government officials, the Vietnamese Ambassador to Lao PDR Mr. H.E. Nguyen Ba Hung and the U.S Ambassador to Lao PDR Ms. Rena Bitter.